LAS edge is an exciting and exclusive summer program that emphasizes self-discovery, highlighting the LAS mission statement of "developing innovative, compassionate, and responsible citizens of the world." Each week of edge is dedicated to exploring one of these traits in depth, introducing students to well-known inspirational people and inviting them to participate in fun activities that are designed to help them explore their unique strengths and build on their self-confidence. LAS edge believes that energized minds are curious minds. By striking a balance between adventure and education we aim to find the sweet spot where excited, curiosity-driven learning occurs. 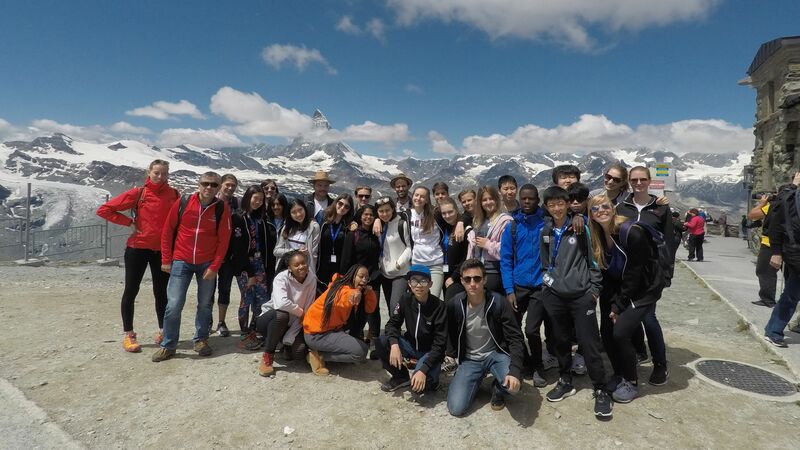 Students will spend three action-packed weeks unlocking their creative potential, perfecting their team member and leadership skills, and jumping headfirst into the adventure activities Switzerland has to offer, including parapenting, whitewater rafting, and indoor skydiving! During summer 2019, students will be able to learn from Tiara Sahar Ataii. Tiara is founder and president of SolidariTee, an entirely student-led charity which raises awareness about the refugee crisis and offers grants to organizations and individuals working in the sector. She founded the charity in January 2017 while studying at Cambridge University after working as an interpreter for refugees in France, Germany, and Greece. Since then, the charity has spread to 35 participating universities across 5 countries. Tiara is also a recipient of the Vice Chancellor's Social Impact Award. If you are looking for a more physical activity, grab a paddle, grab a board, and enjoy paddling around beautiful Lake Geneva. During the tour of the Hublot watch factory, students will be able to see how some of the most artistic, innovative Swiss timepieces are made. The United Nations seeks to maintain peace around the world. LAS edge students will have the chance to visit this amazing organization and learn about peace, security, and human rights. A trip to Lausanne’s Olympic Museum is sure to leave you impressed! See just what it takes to be the fastest, strongest, and best in one of the world’s most competitive events. Take to the trees and make your way through a fun maze of bridges, swings, and ladders. A day out at the ropes course is sure to get your adrenaline pumping! Zermatt is exactly the sort of town you picture when you think of Switzerland—wooden chalets, pretty storefronts, and a view of the picture-perfect Matterhorn. A day in Zermatt is a day well spent! Want to take your summer experience to new heights? Soar high in the sky and take in a view of the Alps unlike any other in this adventurous activity! This activity is for adrenaline junkies who aren't quite ready for the experience of jumping out of a plane! Get suited up and experience the thrill of free-falling in this gravity-defying activity! LAS edge is designed to challenge, excite, and keep students on their toes- for this reason, no two days within the program are the same. Below you can find some sample schedules showing what a given day could look like.